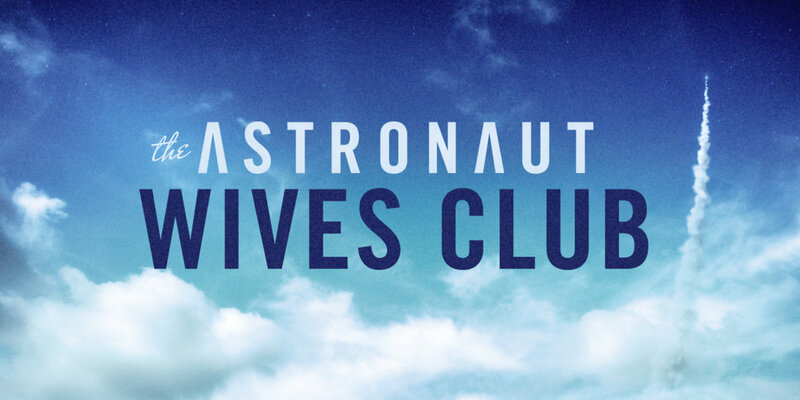 If you have watched the new TV show on abc called The Astronaut Wives Club, then you may have noticed how amazing the food is! 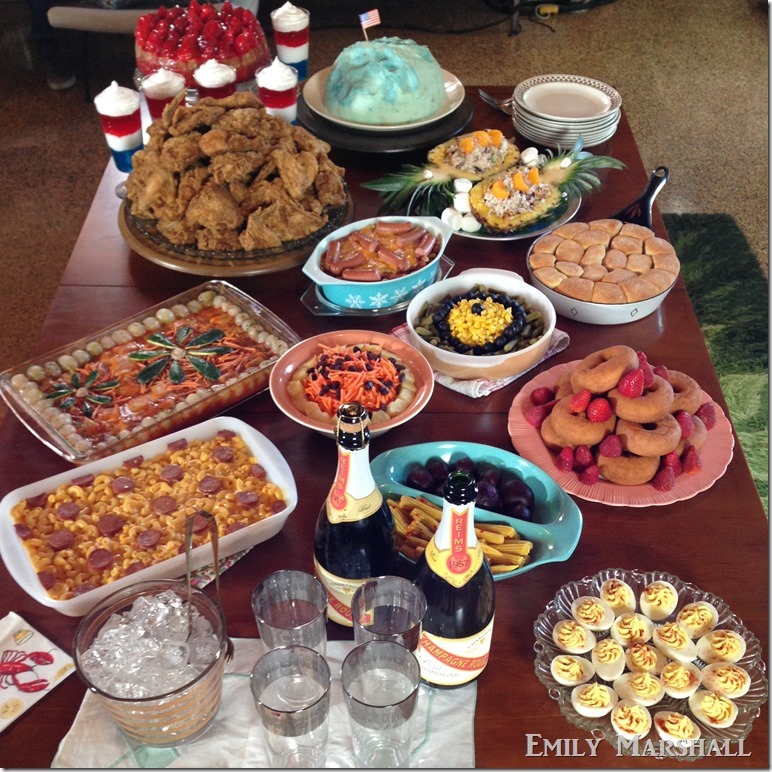 The food stylist Emily Marshall recreated very unique vintage inspired dishes, desserts and appetizers. 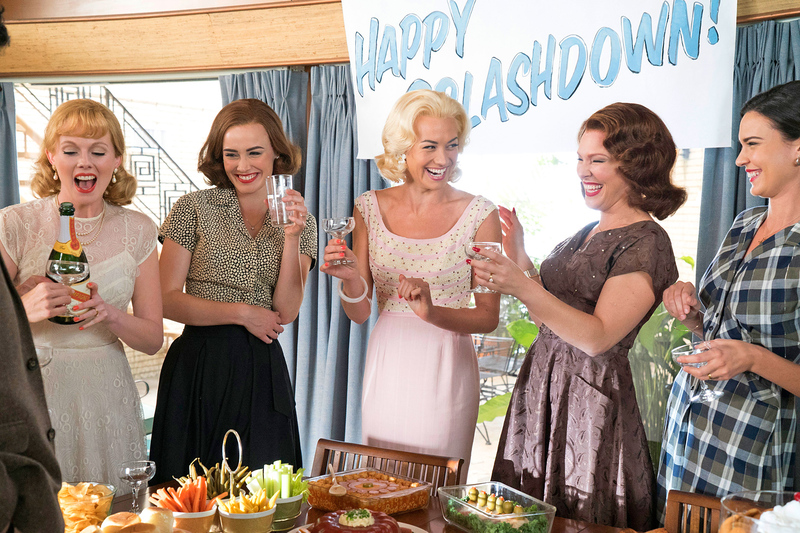 In this post I will be talking about the amazing dishes and appetizers featured in the show. If you want to see the desserts you can see those in my last post here. 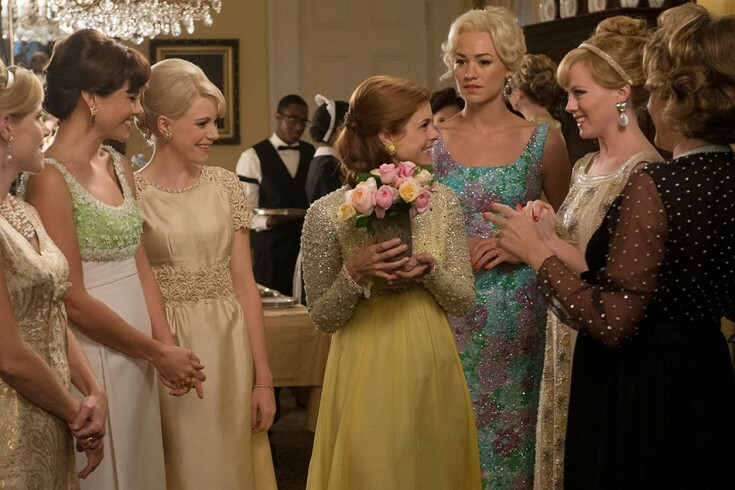 A major part of the show is all of the wives gathering to watch and wait for the astronaut launches, so they all bring food to one of the wives homes and they watch the launch on TV, have drinks and nibble on these great all American dishes. What I specifically like about each and every dish is the attention to detail and the creativeness they put into not only the food but also the dish or Pyrex they put the food into. I found most of the lovely photos from Bon Appetit, links are under each of the photos. Here are a few of my favorite dishes from the show. 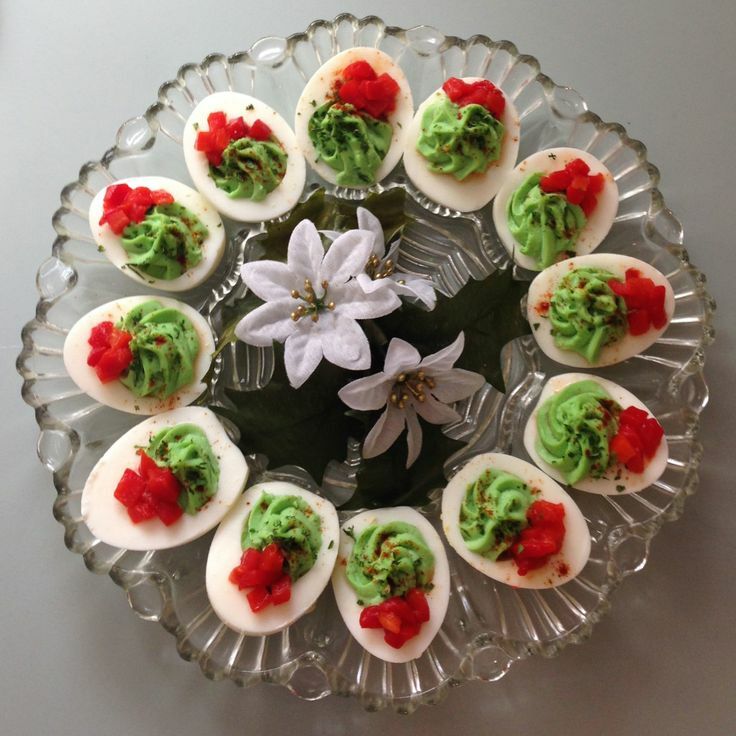 The Christmas deviled eggs have green food coloring added to the egg yolk mixture and garnished with diced tomatoes to add a pop of red for the Holiday color scheme. The appetizer was displayed on a clear crystal platter with white poinsettias in the center. Perfection! 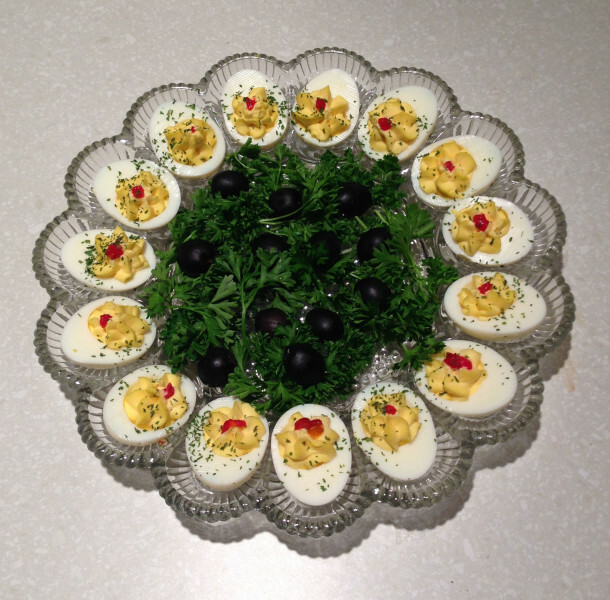 Another version of the deviled eggs, very cute display. These are hot dogs rolled inside crescent rolls and placed in a spiral design and garnished with a red poinsettia for a Holiday touch. 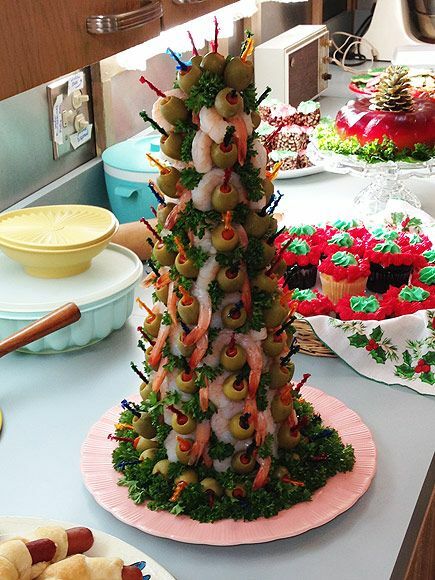 Christmas tree shrimp with pimento olives. This recipe came from Bon Appétit‘s Christmas issue from 1974. 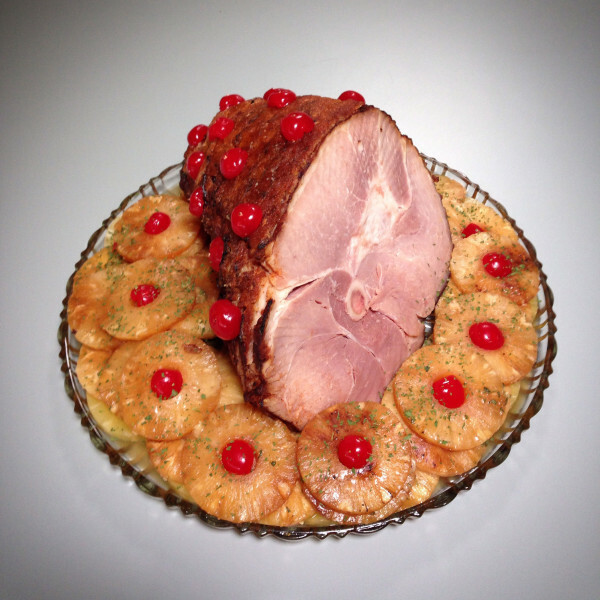 Ham with pineapple and maraschino cherries. 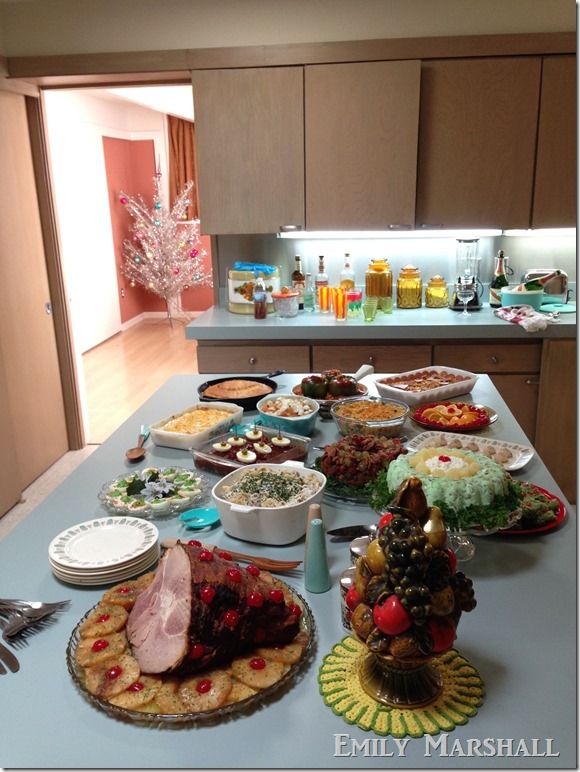 Above are some of the Christmas inspired dishes on display. 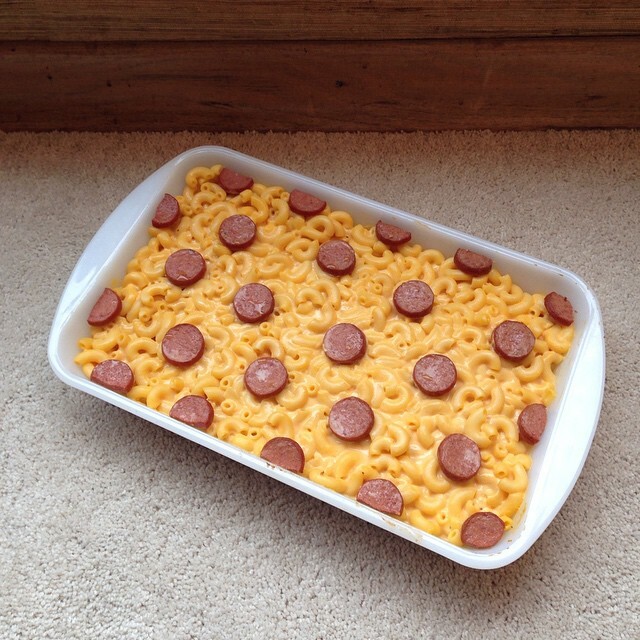 According to Bon Appetit, mac and cheese with hot dog rounds made regular appearances on the show. This dish is a classic and the “polka dot” hot dogs are a nice addition. 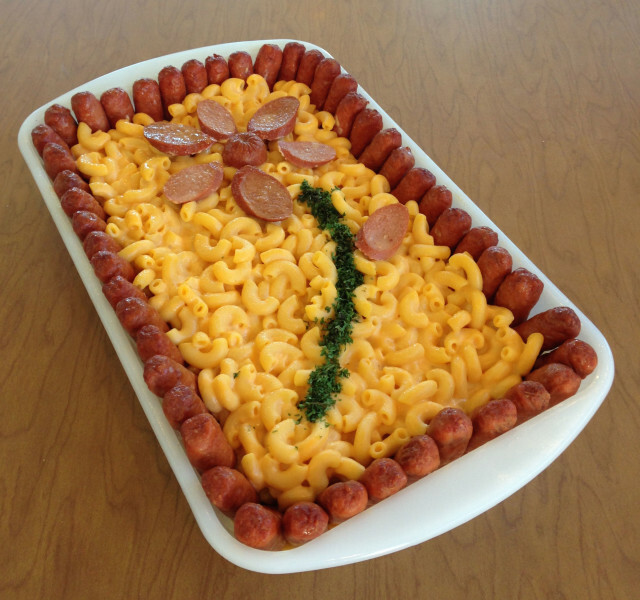 Super cute flower mac and cheese with hot dog flower and border design. Another way to present the classic dish. 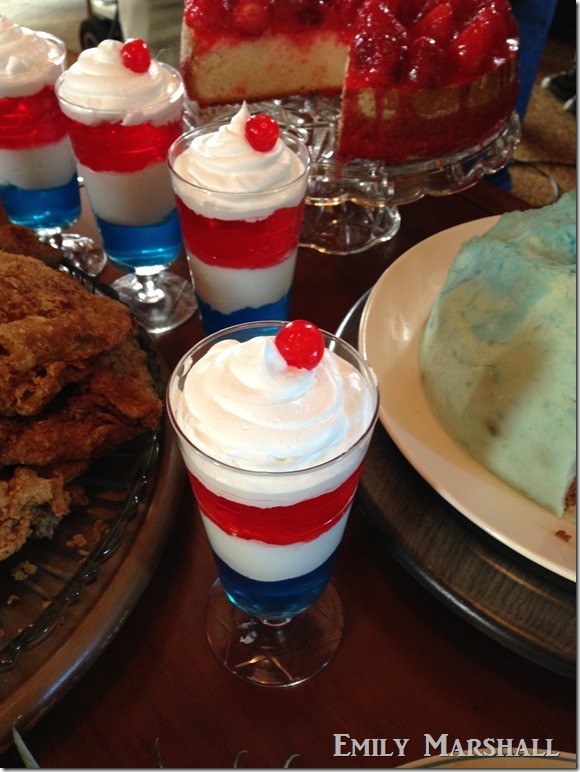 Jell-O multi color parfaits topped with whipped cream and a maraschino cherry. 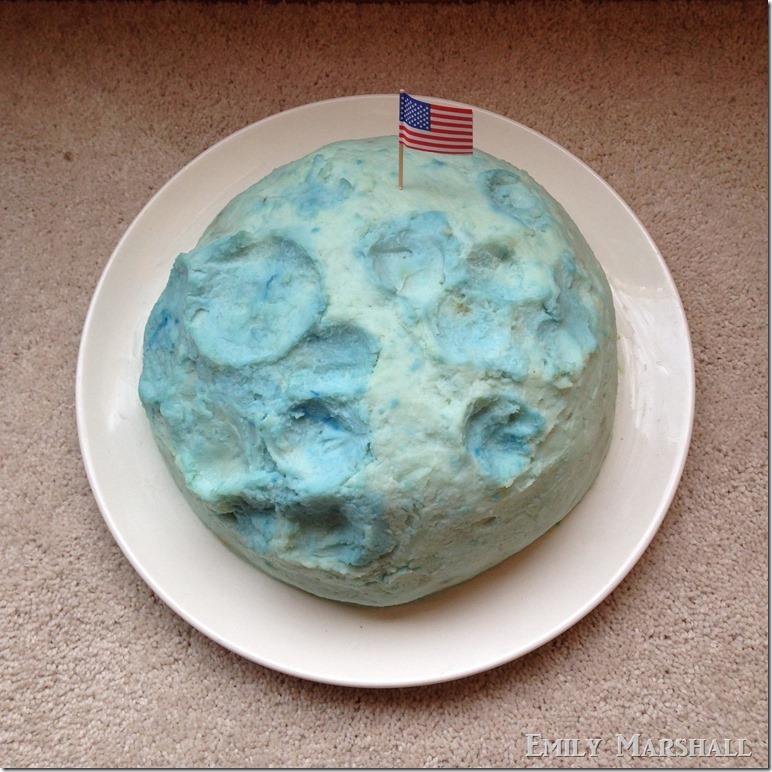 This clever moon loaf is actually mashed potato covered meat loaf! This is an interesting and very fitting spin off of the mid century recipe for a meatloaf igloo. This is one of my favorites! 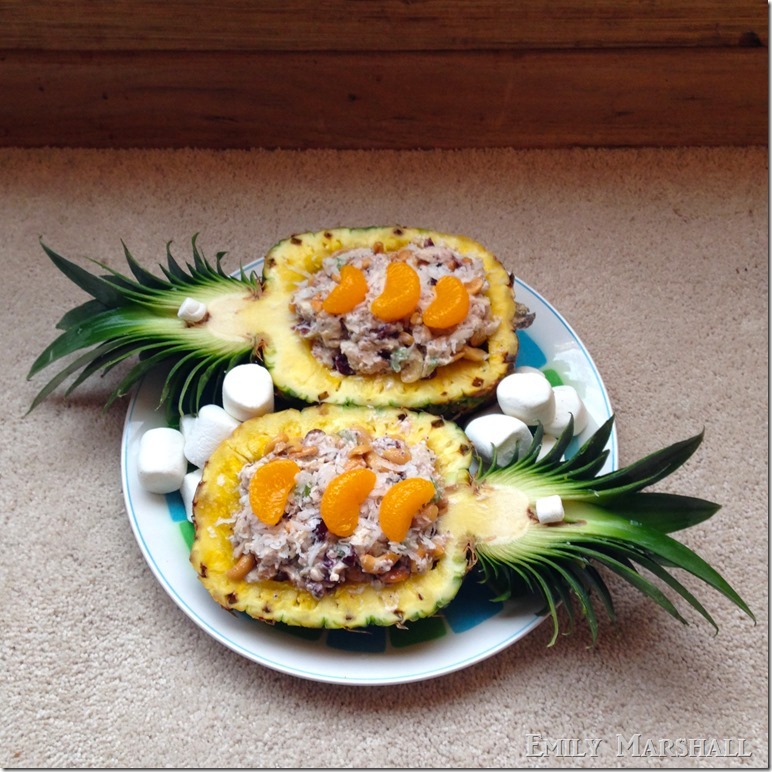 I love how it seems so tropical, but the actual recipe has chicken, mayo, celery, pineapples, chutney, bananas, peanuts, coconut and mandarin oranges and marshmallows. 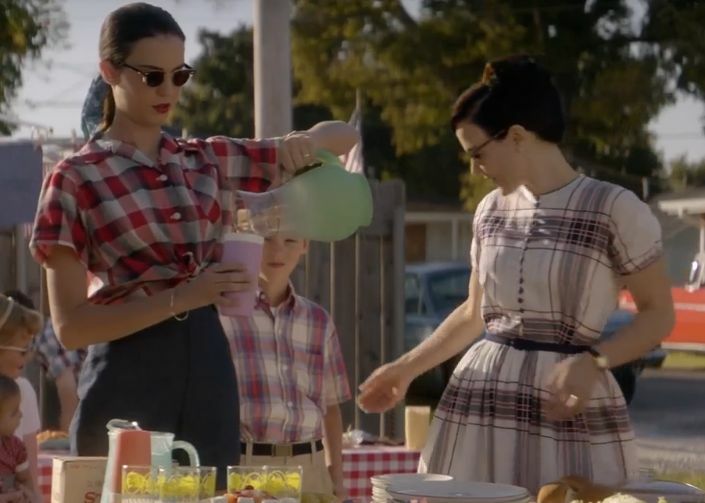 You can see the recipe at the Mid Century Menu. Here is a table display of some of the dishes included above. Very mid century! 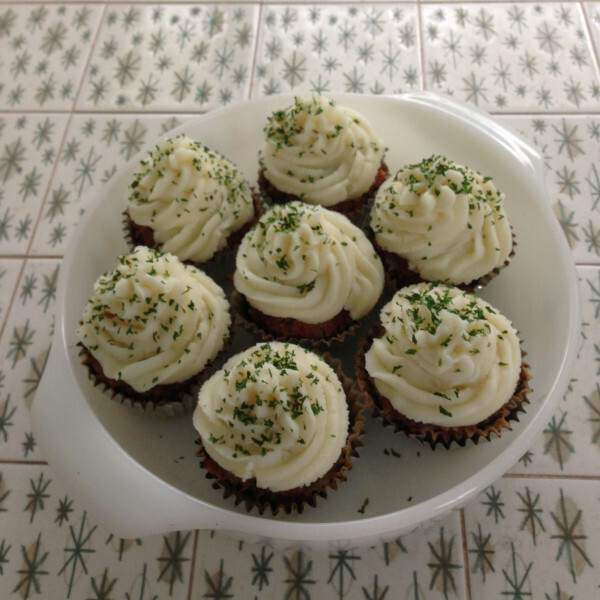 These clever little cupcakes appear to be a regular cupcake, but they are meatloaf with mashed potato frosting! I am definitely going to try these. Marge Slayton pictured holding one of the very swell cupcakes! This tray is simple and classic. 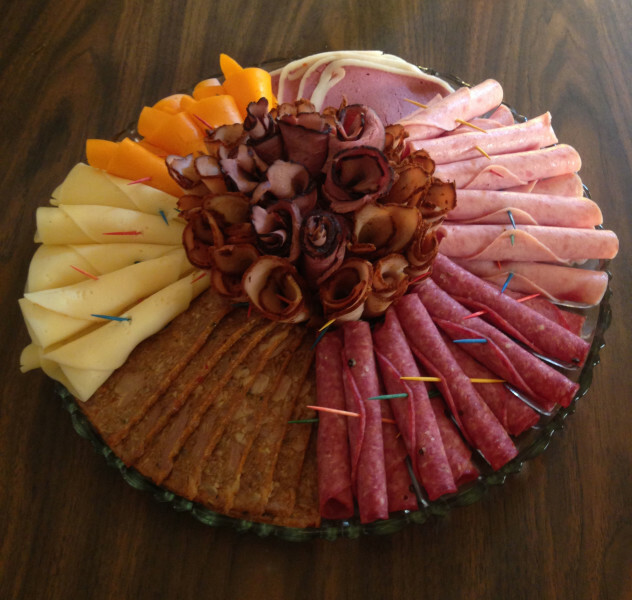 I like how each piece of food is rolled and has a colored toothpick in the center for that extra pop of color. 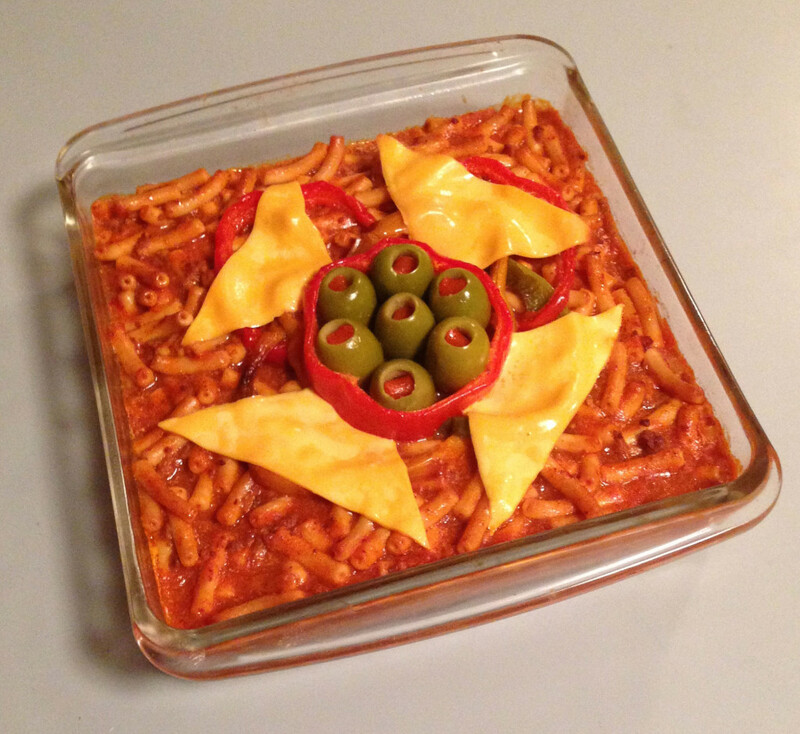 The famous Chef Boyardee Beefaroni garnished with cheese triangles and pimento olives. Cute casserole idea! These are just a few of my favorites from the show I hope you all enjoyed it! Below I included two trailers for the show if you have never watched, this will give you an idea of what it is about.